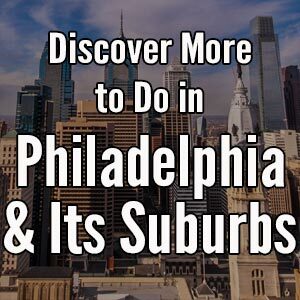 As one of America’s largest and most popular travel destinations, there are hundreds of places to stay in Philadelphia. 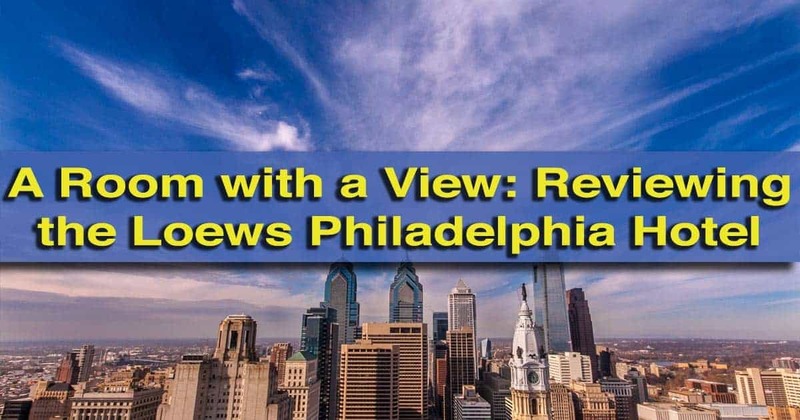 However, if you are looking for a historic hotel with a great view, you can’t do much better than the Loews Hotel in Philadelphia’s Center City. 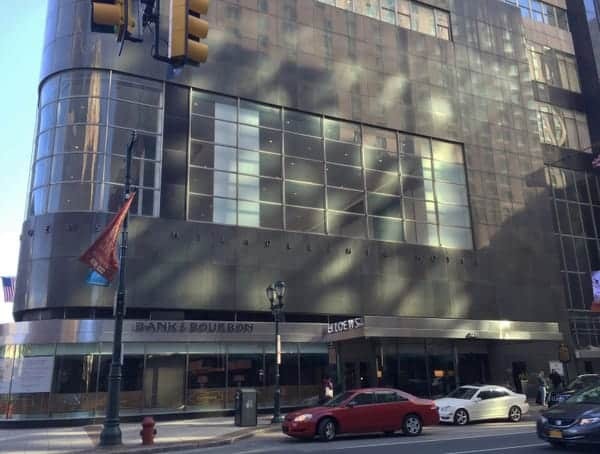 The Loews Philadelphia Hotel [Affiliate link] is located in the former Pennsylvania Savings Fund Society (PSFS) Building, a fact that isn’t easily missed thanks to the bright neon lettering on the hotel’s roof. The PSFS Building was built in 1932 and is considered the first international skyscraper ever built in America. This fact makes it one of the most architecturally important buildings in the city and has garnered it a historical marker on the sidewalk outside the hotel. The Loews Philadelphia Hotel as seen from the streets of the city. The nearly 500 foot tall skyscraper was the headquarters for the PSFS until their bankruptcy in 1992. It was purchased by Loews in 1997, and officially opened as the Loews Philadelphia Hotel in August 2000. 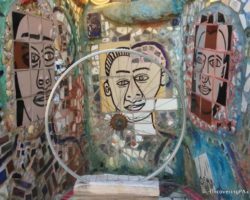 I was excited when I was recently invited to stay at the Loews Philadelphia Hotel. The hotel’s history piqued my interest, but the rumored amazing views really had me excited to see what this hotel was all about. 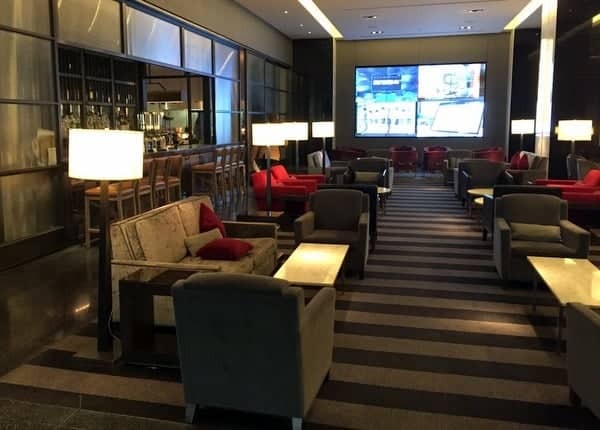 The lobby of the Loews Hotel has been converted into a check-in area, a sitting area that has a wall of TVs, and a very nice looking restaurant and bar known as Bank and Bourbon. Even if you don’t spend much time in the lobby area, it’s hard not to be impressed with the quality of the furnishings. The sitting area of the Loews Hotel lobby. 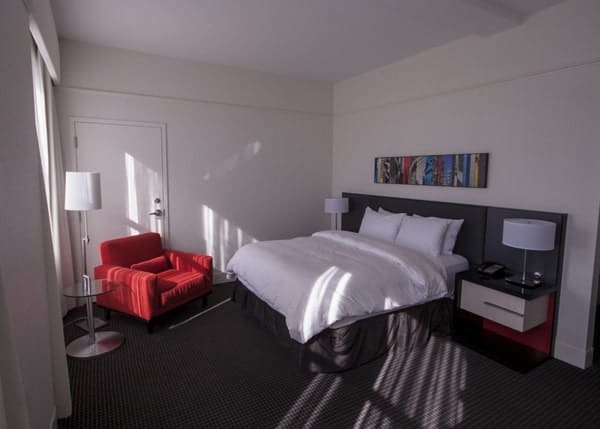 Rooms at the Loews Hotel in Philadelphia have views of either the downtown area or the Delaware River. As with most hotels with a view, the higher your room, the better the view will be. Rooms start on the 6th floor, but you won’t want to be much lower than the 12th floor to be able to experience the great views that the hotel is known for. The view of downtown Philadelphia from a room on the 23rd floor of the Loews Hotel. The best view is from the 33rd floor of the hotel, which is the highest accessible floor. This floor features several ballrooms, so it may not be open to guests at all times, but the view from up here makes a stay at the Loews Hotel worthwhile on its own. 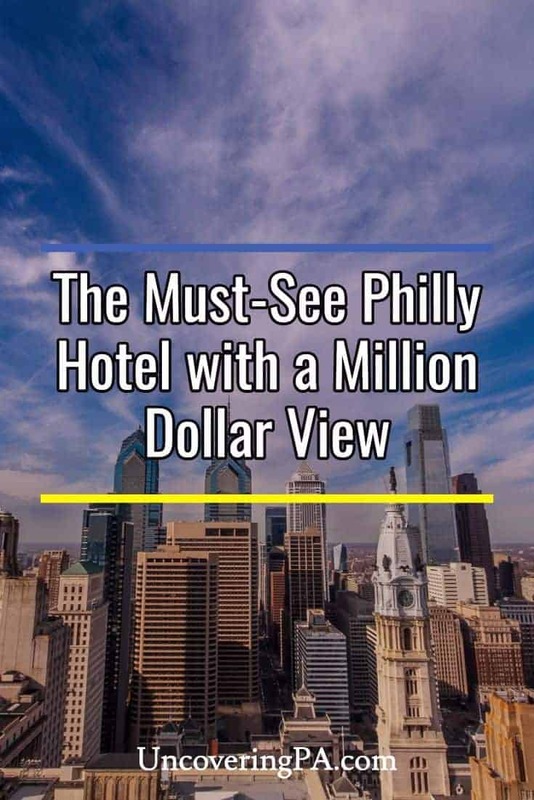 Looking out over the city, you’ll be greeted by one of the best views available in Philadelphia. Of course, if you have a view looking west on the top 15-20 floors, you’ll be able to enjoy this amazing view from the comfort of your own room. I’d imagine the sunsets from here must be amazing! The view from the rooms is great, but you can’t beat the view from the hotel’s 33rd floor. Okay, enough about the view. While that’s certainly amazing, you might actually be interested to know what the rooms are like. I’m happy to report that the rooms at the Loews Hotel in Philadelphia are just as amazing as the view. I’ve never stayed at a Loews Hotel before, so I can’t compare this hotel to their other properties. However, I found the room to be in line with what I would expect from a higher-end hotel brand. The rooms in the Loews Philadelphia Hotel are very nice. The bed was fitted with clean, comfortable sheets, and the furniture in the room seemed both clean and high quality. I loved that the bed faced the windows instead of the TV. While it might have made the TV a little more challenging to watch, it was worth it to be able to lay in bed and look at the amazing view. In fact, after turning off the lights for bed, I laid in the bed for a few minutes just taking in the amazing cityscape. Another great thing about the Loews Philadelphia Hotel is its location. 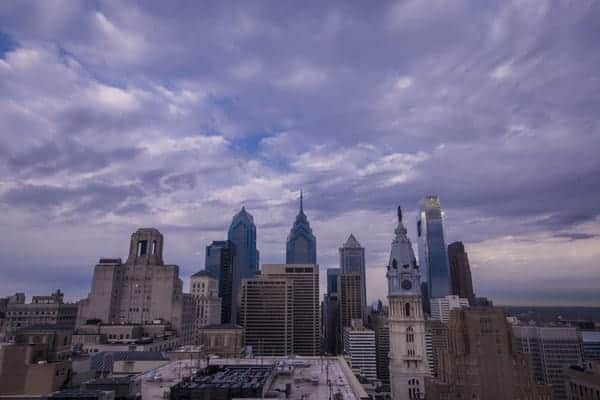 The hotel is located just steps away from Philadelphia’s City Hall and attractions like the One Liberty Observation Deck and the Wanamaker Organ. 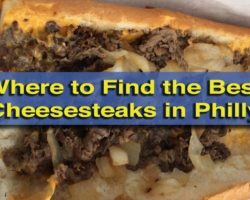 Its Center City location near the intersection of Market and Broad means that you have access to both of Philadelphia’s subway lines and an ample number of buses. 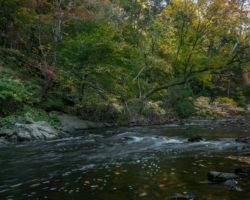 It’s also within a short walk of Philadelphia’s Old City and the historic buildings of Independence National Historic Park. 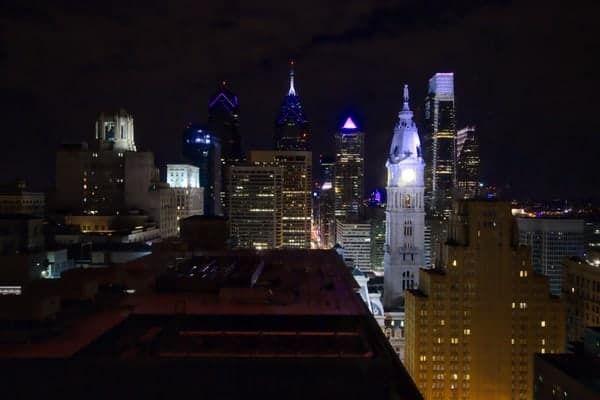 The view of downtown Philadelphia is hard to capture at night, but the view is simply stunning in person. 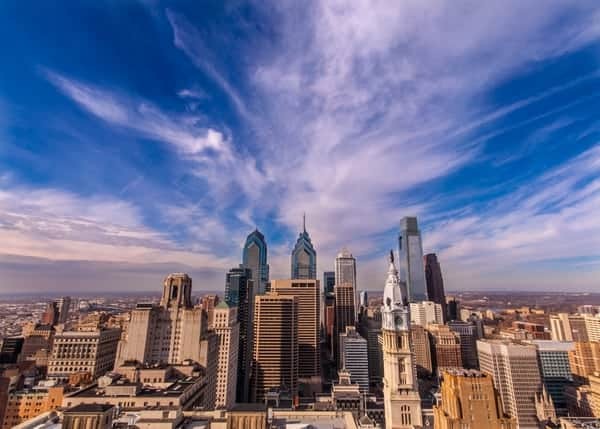 When you combine the historic nature of the building, the comfortable rooms, the amazing view, and the fantastic location, the Loews Philadelphia Hotel is a fantastic choice for anyone looking to explore the amazing sites of Philadelphia. Don’t believe me? Check out reviews of the hotel on TripAdvisor. If you found this review helpful and would like to book a stay, consider checking prices and booking through this link (where we will receive a small percentage of the sale at no cost to you). 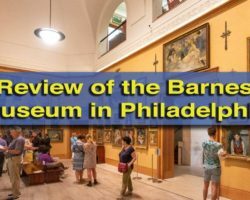 If you want to stay closer to Independence Hall, check our our review of Hotel Monaco, or stay on the Benjamin Franklin Parkway at the Embassy Suites in Center City. Note: My stay at the Loews Philadelphia Hotel was hosted by the hotel. However, the opinions expressed are my own.